Effectively deal with depression using techniques that really work. 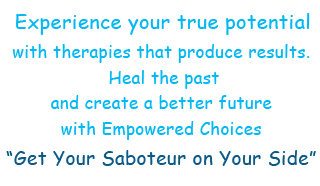 EFT, NLP, and Hypnosis with an experienced counsellor will end depression. Be happy and enjoy your life with the help of an effective counsellor. Depression feels like a huge, overwhelming sadness. Sometimes it’s caused by repressing anger or a long history of suppressing other negative emotions. Other times it is exactly what it feels like, a big, big sadness. In many families, children were not allowed to express anger, frustration, sadness, hurt or fear. Or some people were never taught to express emotions, instead, suppressing them. This actually can help to make a person feel better at the time, but eventually the emotions come out one way or another, often as depression. Our allopathic mental health model prescribes medication for depression, to address imbalanced brain chemicals. And sometimes that’s a good thing. Medication can work, but it doesn’t address the possible causes. In some cases, looking at the past and learning how to release old, stuck emotions and process current feelings will end depression. Especially if your feelings of depression are related to an event, or a difficult history, you can learn to process your emotions much more easily and alleviate that big sadness, that repressed anger or other suppressed emotions. Sometimes people ‘learn’ to feel depressed or hopeless by copying their parents, who experienced those feelings. Children are supposed to learn how to be from their parents, but sometimes their parents didn’t learn how to have positive behaviours and habits themselves. This isn’t their fault, and we don’t blame people who were incapable or deprived of positive models of behaviour, it’s just not very useful. Wouldn’t your parents want what’s best for you, even if it’s different than them? And sometimes a person just needs to learn or relearn how to be happy as they move forward in life. Sadness is a pure human emotion, and it’s necessary. It’s how we experience loss and grief. But it needs to move, process and release. Anger is a pure human emotion too. Anger is how we know our boundaries have been crossed. Children are often not allowed to express anger towards their parents, teachers, or other adults. So it is an appropriate emotion, but it’s old, all these childhood events are over, in the past. It’s time to move on. Fear is how we stimulate our fight or flight response. We need fear, when appropriate, and to appropriate degrees. Children often can’t fight or flee. So they freeze. And stay stuck. Hurt is a real emotion too, if our needs aren’t met, or if we don’t get what we want. All of these pure, natural human emotions. But they need to move, to process, to release. Holding them stuck for years and years hurts us in the long run. Emotion, E-Motion, Energy in Motion. If you want to release any feelings of depression that you have, EFT, (Emotional Freedom Technique or Tapping), NLP (Neuro Lingustic Programming), Regression Therapy, and Hypnosis are very successful. You’ll notice shifts and changes in your mood quickly, and in how your moods affect your life. There are thousands of documented cases showing vast improvement from depression with these modalities. Please remember that sometimes depression does respond best to medications prescribed by your Mental Health Practitioner. If you want to make changes to your prescription medication for mental health issues, please consult with your GP.